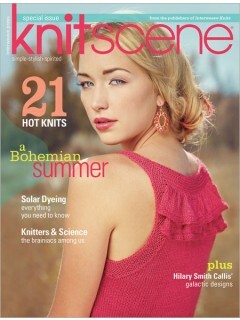 Twenty-one designs show off summer fibers and streamlined silhouettes while exhibiting Knitscene's fresh appeal. Learn about solar dyeing, knitting scientists, Cirilia Rose's trip to Amsterdam, and designer Hilary Smith Callis. Styles include 60s necklines, peplums, tennis sweaters, and lots of lace for those hot days ahead.